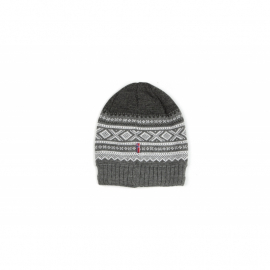 The MARIUS®pattern© is the most handknitted pattern in Norway. Elected as one of the 100 best Norwegian designs the last 100 years. Today regarded as a Norwegian icon, capturing the Norwegians´ love of outdoor life in the free Norwegian nature. The designer Unn Søiland sold her handknit pattern to Sandnes Wool factory in 1953, but retained the production rights as currently administered by Marius of Norway AS. The picture of Marius Eriksen, the Norwegian actor, warhero and skiier, promoted the front of the pattern in 1954. 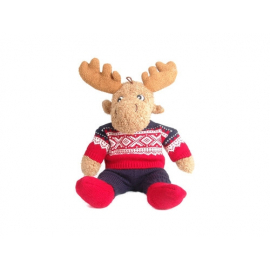 ELGAR WITH MARIUS SWEATER, RED The Norwegian cuddly moose with the Marius® sweater. A perfect souvenir from Norway. 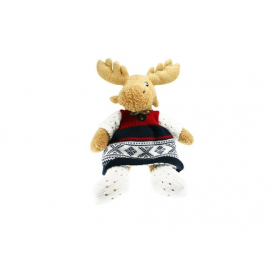 ELGAR WITH MARIUS DRESS The Norwegian cuddly moose with a Marius® dress. A perfect souvenir from Norway.